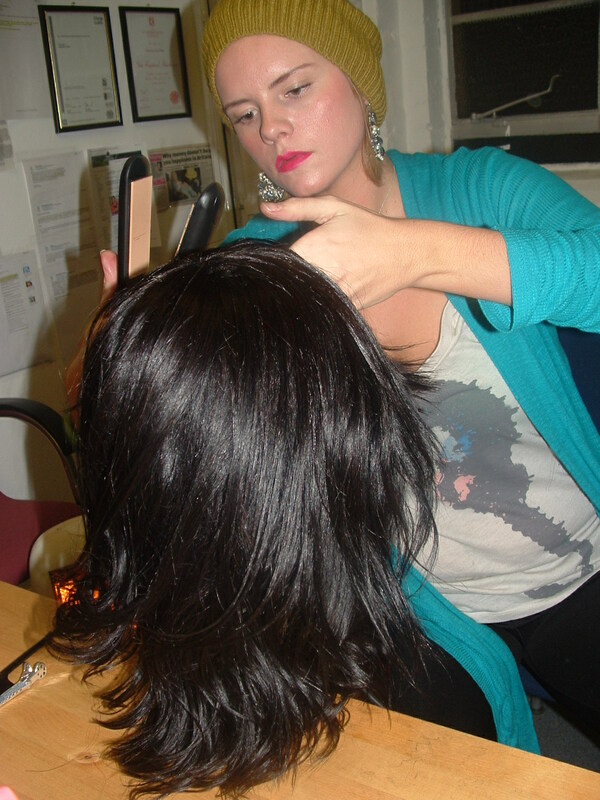 A career in Hair & Beauty is the guaranteed way to get into employment and make money in today’s economy. This is because there is always a high demand from clients for professionally trained and qualified hair stylist who offers quality service and good customer care. Most celebrities now rely on extensions weaves to get the desired look they want for their self-esteem and image presentation. Celebrities such as Lauren London, Beyonce, Kelly Rowland, Cheryl Cole, Kim Kardashian, Paris Hilton, Victoria Beckham, etc are all known for their weaves and hair extensions. In the UK 2004, it was worth £60million. South Africa in 2002 it was $90million. By 2013 in the US it will be worth $4.2trillion. To get into this career and earn the money you deserve, you require professional training from an organization that will equip you with industry standards and build your confidence to start working with clients immediately you complete your course. World of Braiding & Extensions will enhance your knowledge and boost your confidence to help you gain clients as you complete your training. There are specific tactics that can help you get into this industry and we are happy to give you all the tips and tricks of the trade. To get you started, we have put together this special Course to train you on your way to Natural Hair and Extensions Designing. No hype or fuss, just simply skills and information that will get you into employment. Get International accreditation with Habia CPD certification. 1. 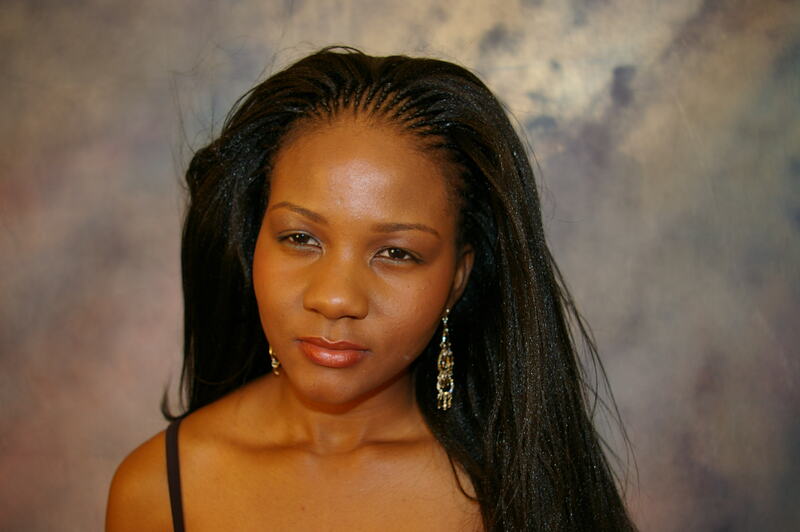 Cornrows – natural hair 2. Cornrows add extensions 3. 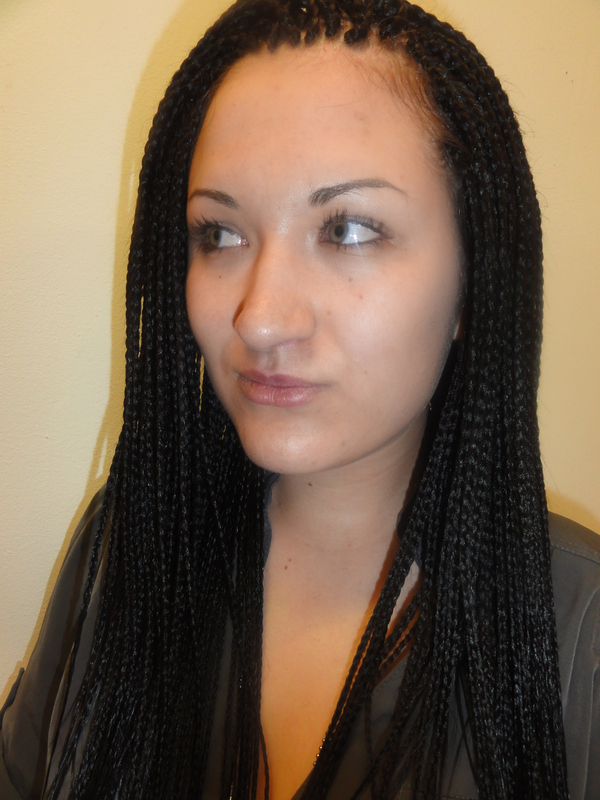 Full Cornrow Sew-in Weave Extensions. How to professionally consult with clients to know what they want. How to cleanse and prepare hair for the chosen techniques. How to neatly section/partition hair into the right shapes for the chosen technique (cornrows). The correct braiding fingers and how to use them for the chosen technique. Pick strands of hair with the correct finger placement and sequence for the chosen technique. Firmly hold the base of a chosen technique with the correct grip to avoid causing damage and possible traction alopecia. Smoothly continue and neatly complete a strand of chosen technique. Complete a professional full head of natural hair in chosen technique. Introductions to Hair Extensions and why we need them. 6 days training from 10am – 5pm. If you already own a salon and want to add modern healthy hairstyles to suit your clients. If you want to grow your salon by adding more skills to your current knowledge. If you want to avoid turning clients away because they demand styles you are not able to offer. If you love natural hairstyles – cornrows natural hair, cornrows with extensions, full cornrow weave, but don’t know how to go about getting into the business. If you are unemployed and have a passion to see other people looking beautiful with current hairstyles. If you have been practicing natural hairstyles but you want to move it to a more professional level so as to attract high-end clients etc. Continuous assessment is built into the programme to include questions and answers, repetitions, demonstrations, discussions etc and practical work on models may be carried out within our commercial Salon (where applicable). You may be contacted to participate in hair shows /events, seminars, trade shows where applicable – to help you gain confidence and understanding of the industry. You will be given on-going support when required etc. The assessment methods will be explained to you by your tutor and feedback will be given to you on a continuous basis. To gain Habia certification, you will be required to produce and submit a PORTFOLIO of your work for assessment. Once you successfully complete the Full Cornrow Weave course you will receive Habia Certified CPD qualification in Weave Hair Extension. You will be able to obtain public liability insurance. You will be able to start working with clients and start earning your money back. You will be advised of your training centre. You should be in the hair industry. In addition, you must have an interest in the natural hair weave industry and a passion for hair. Become a freelance/ mobile stylist. Your earning potentials may vary according to locations, experience and time commitment. Progressions routes will be discussed during your course. 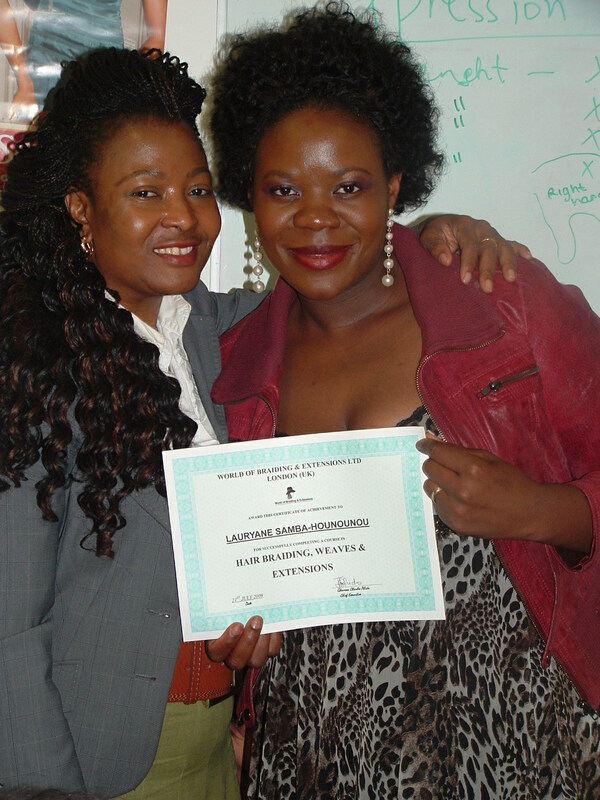 Joy Phido is a qualified licensed hairdresser /cosmetologist. 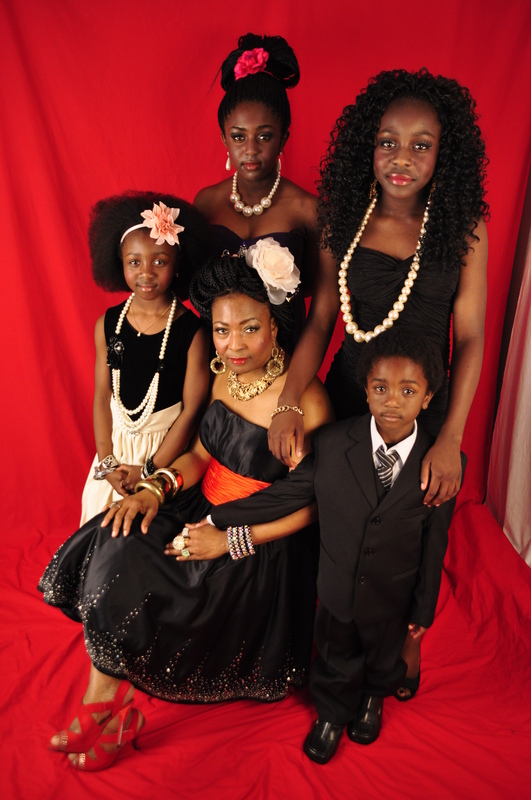 She is an internationally established Natural Hair and Extensions Educator, Specialist & Designer. As the Artistic, Creative Master Director at World of Braiding Joy is inspiring women and younger generations to embrace not only natural hairstyles but to get into the Business in order to create wealth for themselves in the hair industry. Joy is a mother with 4 children and has first-hand experience on how difficult it is to work and run a family especially in the Western world. After working in corporate Nigeria as a banker and corporate England in telecoms, Joy tried her hands on buy and sell businesses which failed. She eventually realized that to succeed in business; you need to have a skill in your hands first. In addition to her natural passion and skill in hair designing, Joy took series of professional training from across different continents and now has the mission to give students real skill of running a hair Business. As a way of sharing her knowledge and encouraging other women in business, Joy has been active in conducting seminars, workshops, events etc across various continents. She can be seen on Youtube sharing her knowledge and skill with over 2million views and over 8,000 subscribers. She has written e-books and produces DVDs for sale to help her clients understand the industry better. This is why World of Braiding has become a success and it is this passion of owning your own skill that motivates Joy in helping people who come to World of Braiding & Extensions for training. Here are just a few testimonials from Students across the world that Joy has trained. Celestes –Salon Staff – USA. After completing Introduction to Braiding and a course in Extensions everything changed for me. 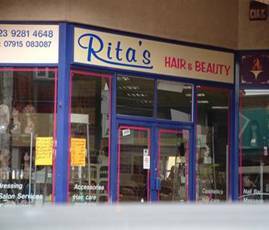 With the skill in my hands, I changed my small salon into a huge cosmetics and beauty shop in Portsmouth. I combine my skill with retail of hair extensions & products. This has changed my life as I am a different person and a lot better than I ever dreamed. I cannot begin to quote my weekly earnings. Thank you so much World of Braiding. I attended the Track Weave Course at World of Braiding to add more to the knowledge I have in natural hair and extensions styles. On completion, I set up my own business and since then I have not looked back. It may be tough running a business sometimes, but I am glad I took the plunge to set up my own business. Thank you so much World of Braiding. Following our earlier announced planned US familiarisation workshop tour, we hereby express our sincere gratitude to the overwhelming support of our friends and followers who have indicated interest to attend the events. As part of preparations for the event there has been a lot of question concerning confirmation of locations for the venues. We are excited to announce the following locations to enable you plan your journeys to the venue. If you require advanced Course, let us know during booking to be informed about materials required. You can order your materials from us prior to the trip otherwise, feel free to purchase from other sources such as ebay.com or other places as we are unable to provide them due to excess travelling materials. For other personal questions, please feel free to contact us. Why should I choose World of Braiding & Extensions for my training? Our passion is giving you the skill to help you gain financial freedom and prosperity. Our Chief Executive – Joy Phido is a mother and as someone with children, she understands how difficult it is for mothers to juggle work and family life (work for other people as well as run a home). This personal experience has made her determined to help anyone who is interested in setting up their own business to work around their family. Our training is flexible and we are happy to work around you no matter your personal circumstance. You gain international Certification that is recognised worldwide. Your training is done in a friendly environment, done in a step-by-step basis guaranteed to make sure you achieve results. You gain theory, information on personal experiences as well as practical skills which helps you become confident when working with clients. Our experience spans across continents – Africa, USA, Europe and UK so you are well informed about the world industry and standards. Here are just a few testimonials from Students across the world that World of Braiding has trained. Register now to book your place as time is not on your side to get started and we do not know when our next trip to US will be planned. The sooner you train, the sooner you develop your skill and the sooner you start earning your income to change your life. Spaces are limited and booked only on first come first served basis. World of Braiding is World’s No 1 PROFESSIONALLY ACCREDITED NATURAL HAIR & EXTENSIONS ACADEMY WITH OVER 8 YEARS TEACHING EXPERIENCE IN NATURAL HAIR & EXTENSIONS. Joy Phido is an internationally established Natural Hair and Extensions Educator, Specialist, & Designer. Joy is a mother with 4 children and has first-hand experience on how difficult it is to become someone’s staff and run a family especially in the Western world. In addition to this, Joy has tried so many retail businesses which failed and eventually realized that to succeed in business; you need real skills in your hands first. 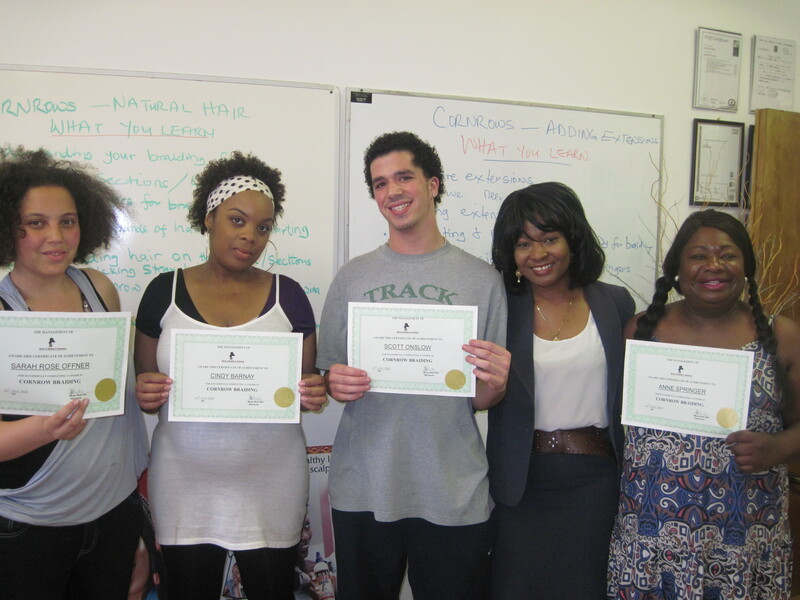 This is the basis of Joy’s mission in training students in hair – to give women the real skill of running a Business. This is why World of Braiding has become a success and it is this passion of owning your own skill that motivates Joy in helping people who come to World of Braiding & Extensions for training. 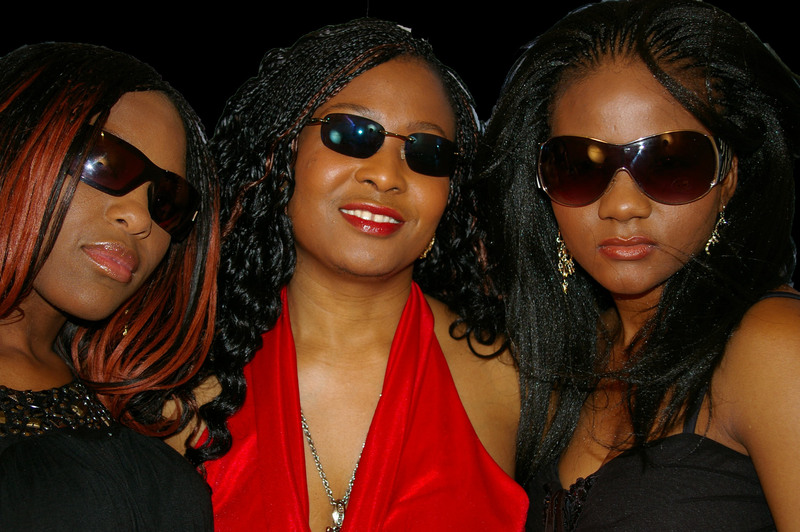 Joy has a BSc in Business Admin, a qualified NVQ Level 3 Hairdresser, a State Registered Hairdresser (SRH) with UK Hairdressing Council, various certificates in natural hair, weaves and extensions in addition to over 20 years Natural Hair & Extensions experience. She is also a qualified teacher, an NLP practitioner with varied career experiences. 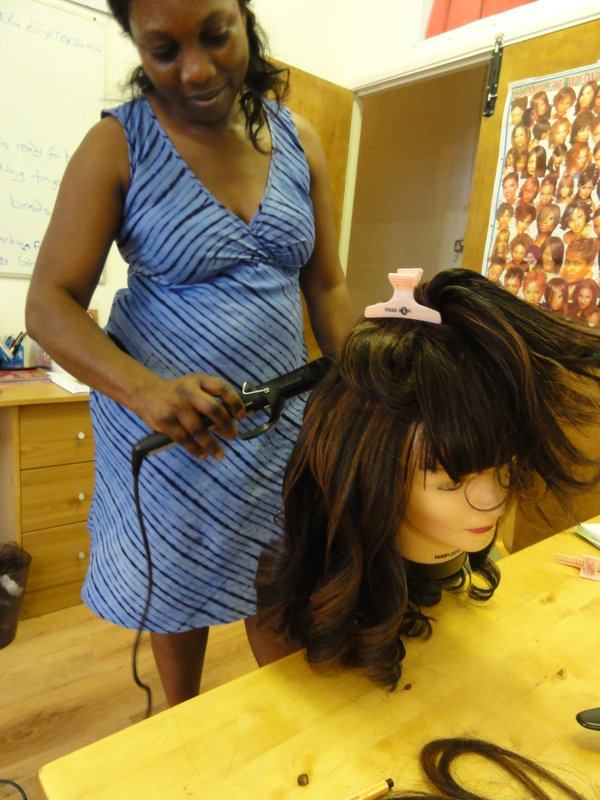 Before setting up World of Braiding & Extensions, Joy taught with Newham Council London – Adult Education Department (Newceys) for 5 years teaching 4 different centres with classes as big as 30 students in some classes. As the Chief Executive and Artistic Director at World of Braiding & Extensions, her passion is to make Natural Hair and Extensions a professional skill as well as help stylist understand how to turn the skill into a business making money while designing glamorous hair on clients. Joy’s passion for natural hair is also comes from the fact that she experienced hair damage with chemical relaxers which made her start wearing natural hairstyles thereafter. Joy can be seen as an evangelist for natural hairstyles where she and her children wear natural hair and she is no stranger on the internet writing from her blogs, teaching on Youtube with step-by-step videos to constantly enrich students’ knowledge with over 1.5million views and over 6,000 subscribers. She is also a Natural Hair & Extensions Business Mentor and adviser helping students & practitioners not only on how to get into the industry but how to become successful and prosper in the industry. She brings a wealth of knowledge and personal experience to this training to enhance your learning. World of Braiding & Extensions is constantly exhibiting at Hair events, taking part in major projects and designing hair for fashion shows and events. Individually priced – contact us for details. A BIG CONGRATULATIONS TO ALL OUR GRADUATES / ALUMNI ALL OVER THE WORLD (TOO MANY TO NAME) WHO ARE FLYING THE FLAG AND DOING US PROUD. WE APPRECIATE YOU AND WISH YOU EVERY SUCCESS IN YOUR BUSINESSES. REMEMBER WE ARE HERE FOR YOU AT ALL TIMES. their love for everything extensions – hair, nails, tanning, night life etc. This is where our story today starts. A client walks in the shop and is desperate for help. I was late getting to the shop as my day was going to be a video production day and not for clients. But this is one of the perks of being on the high street where clients walk in without appointments. So I get a phone call to desperately come in as someone needed help. I walk in to the shop and saw her sitting looking glum and very sad. I wondered what was wrong but as is customary of our service, I ask her if she was okay and she replied back that she was not okay. I settled down and came to her to hear what the problem was. Her story. She had got her hair into glue gun extensions the previous day but had not slept throughout the night. This is because the stylist who claimed she was an expert at extensions had put the extensions in completely wrong. The extensions glue had been applied directly on her scalp and it was so tight that she had headaches all night with her scalp gone sore and constantly throbbing. Details of the story. She had got to this shop at 9.00am and after hours of wait, arguments and eventual agreement, finally got attended to in a process that did not feel right. She was expected to pay for all the materials needed for the hair extensions process exclusive of the fee she was going to pay for the service. She had to wait in the shop while the materials were bought. In the end the process was completed at about 11.00pm. Her head was sore. She woke up the next day in agony and immediately ran back to the salon with the intention to take it out but it was closed and she had no idea when it was going to be opened. She was now desperate and started going from salon to salon asking who could take out the extensions. No salon could help her as all they tried did not take out the extensions but her hair. Her head had gone red and sore as the glue stuck to her scalp firmly. To cut a long story short, we were able to take out the bad hair day extensions using only the best glue removers in the industry without causing her any pain or hair loss. This is a familiar story we have seen with our 3 months experience in Essex. Young Caucasian girls getting different types of extensions done by untrained inexperienced stylist. Among lots of the cases we have had to attend to, another case which was quite pathetic was a situation where a stylist had applied bonding glue on a client’s head all the way to the hairline which was very visible to an onlooker. When it goes wrong they desperately come seeking help. When you offer professional service, they claim it is expensive and they run off to cheaper salons. The result is damaged hair and these girls will go bald before they are 30 years old. We are happy to help but we will be happier to attend to these clients without having to mop after other people’s mess. Some other known cases include – Kim Kardashian, Victoria Beckham, Britney Spears, Coleen Rooney, Naomi Campbell etc. 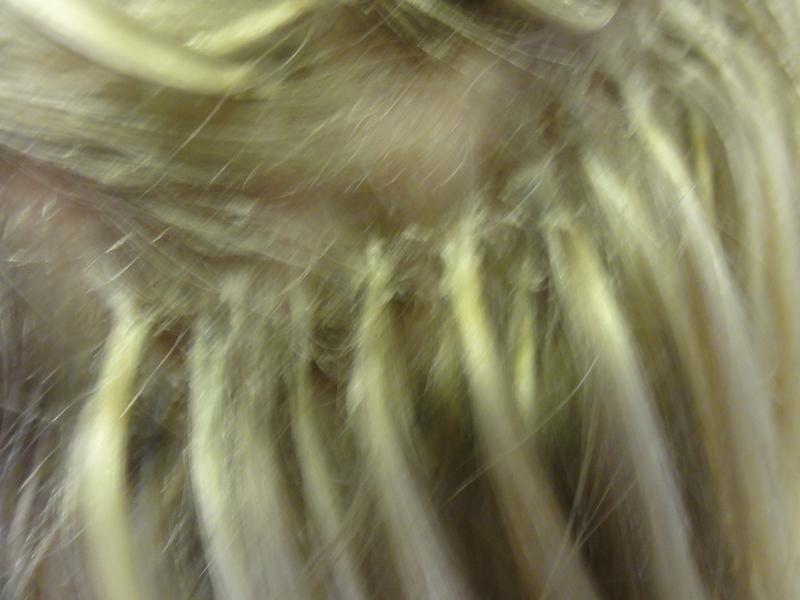 Hair extensions when not done professionally or with care can seriously lead to traction alopecia and alopecia areata. What is Hair Extensions: Hair extensions are the addition of virgin, artificial fibers or anything that is not your own hair into your hair. This way of achieving long hair has become very popular recently among all races. In the past extensions was only popular with Black girls but now this is no longer the case. Lots of people still struggle to understand hair extensions. 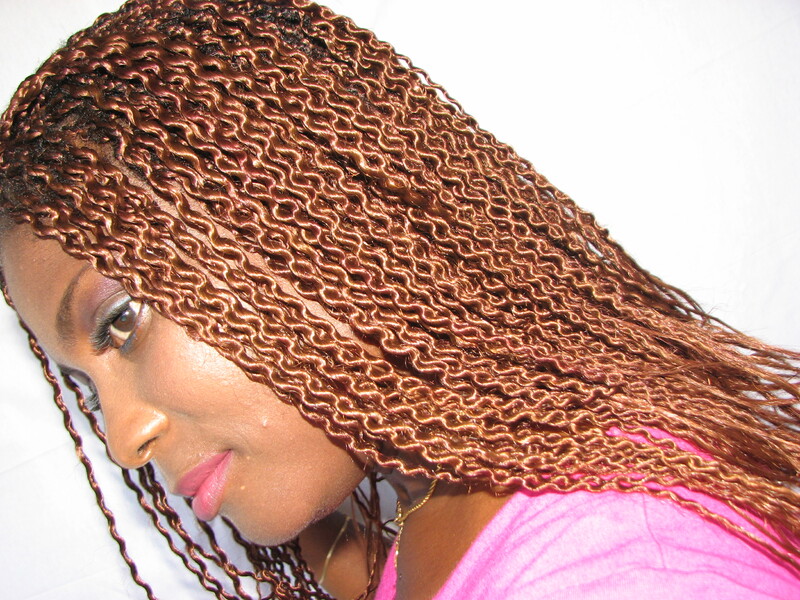 Braiding with extensions – single plaits with extensions, cornrows with extensions, twist with extensions etc. Weaves extensions – full head sew-in extensions, track sew-in extensions, interlock sew-in weave etc. What makes a difference between types of hair extensions will depend on how healthy they are applied, how natural and realistic they look when compared to the natural hair, how comfortable the hair extensions feels on the client’s natural hair, how durable they last in-between salon visits, how much they cost to get the service done, the products used to achieve the result, how informed; experienced and educated your stylist is etc. Length – We need hair extensions for instant length of hair (our hair grows up to 13cm per year – which depends on a healthy lifestyle, the healthy food we eat, the quality products we use, genetics, age, health etc.). Change of Colour/Highlights, easy styling of our hair, for beauty, durability, for versatile look especially for people with celebrity lifestyle etc. Don’t apply the wrong type of extensions on your hair without detailed consultation with your stylist. Don’t become addicted to wearing extensions and not take a break occasionally to rest your hair – this is because the hair gets stressed from constant abuse – pulling and tugging. You will have damage if you do not treat your natural hair with care – using good quality products – shampoos and conditioners, applying the right treatments – deep condition & treatment, split end trims and cuts etc. You will have damage if you do not use professional service to take out your hair extensions etc. Work with professional stylist who are well trained and have the love of your hair at heart. Have a detailed consultation with your stylist and understand what type of extensions will suit your natural hair without causing you damage. Learn to take advice – I deal with clients who simply do not listen to advice as they mentally take on an idea of what they should look like. Treat your hair extensions with care as if it was your own hair as well as treat your own hair with care. 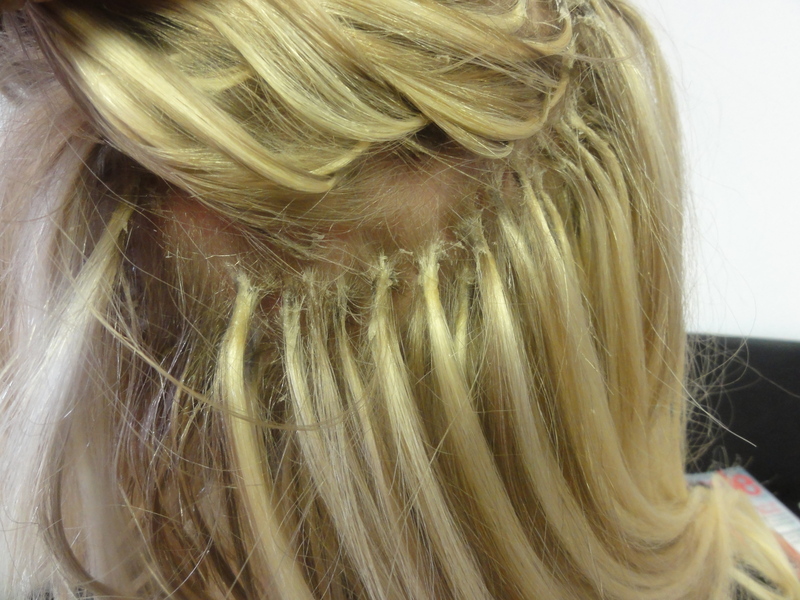 Do not wear your hair extensions for too long as it affects the health of your hair. Use professional service to take out your hair extensions. Give your hair a rest from extensions occasionally and give it good treatment when not in extensions. If your hair is damaged, do not use hair extensions. Wait for your hair to get back to good health before applying hair extensions. World of Braiding offers healthy hair extensions techniques as our client’s hair health is our passion and concern. 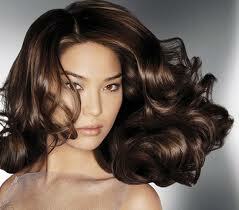 We consult with all clients before taking on a service of hair extensions. We care for your hair and ensure there are no damages. We also train you with the best ways to apply all the different hair extensions techniques. Joy’s passion for natural hair is also associated with the fact that she experienced hair damage with chemical relaxers which made her start wearing natural hairstyles thereafter. She can be seen as a Doctor for healthy natural hair where all her children wear natural hairstyles and she is no stranger on the internet writing from her blogs, teaching on Youtube with step-by-step videos to constantly enrich students’ knowledge with over 1.5million views and over 6,000 subscribers. She is also a Natural Hair & Extensions Business Mentor and adviser helping students & practitioners not only on how to get into the industry but how to become successful and prosper in the industry. She brings a wealth of knowledge and personal experience to this training to enhance your learning. World of Braiding & Extensions is constantly exhibiting at Hair events, taking part in major projects and designing hair for fashion shows and events. Welcome to World of Braiding & Extensions Complete Training Brochure. Please take your time to read through to see what is suitable to you. If you require more information do feel free to call us. Also see the testimonial of students we have trained at the end of the page and how we have helped them achieve their dreams. We want yours to be our next testimonial. 2 Theory into every technique you learn so you gain clear understanding. c) information on current hair styles and names. 4 General information on Business management with our Hair Beauty Bootcamp – this includes business knowledge, information, web site, business plan, social networking sites membership etc etc. c) Marketing tips on how to grow your business when you spread the word, marketing plan etc. 5 Get a folder to contain all the information you need to know. 6 Get a portfolio of your pictures – ready for your clients and possible employers. 7 Get 2 weeks after training work experience with us to gain confidence – if you choose or we will introduce you to a salon near to you to gain experience. 8 Get 2 hours one-to-one business and marketing advise from the Head of training to get you started in your business. 10 Our training is flexible so we allow you the opportunity to choose a time to suit you, choose a training plan that is suitable for you and work with you according to your needs – beginner or advanced levels. 11 We introduce you to clients as your name is included on our database where work nearest to your area of practice will be passed on to you. 13 We introduce you to clients as your name is included on our database where work nearest to your area of practice will be passed on to you. 1 Gain a skill that is yours for life and a skill that puts money in your hands. 2 Earn from £500 – £1,500 a week when you start using your skill immediately. 3 Become your own boss when you start your own business. 4 Work from home, in a salon, start your own salon or grow your salon when you add on more services. 5 Offer your service freelance or become mobile. 6 Meet new people and make new friends in your business. 7 Be free to travel to anywhere with your new skill. 8 Have the knowledge to work on all hair types which increases your customer base. 9 Relocate to anywhere in the world to a place where you are appreciated. With our HABIA Certification you will gain professional and international recognition. 10 There are no job losses or redundancy in your skill as you decide when and how to work with it. 12 Your skill is transferable and you can pass it on to your loved ones. YOU. We can train you irrespective of age, race or gender from complete beginner to advanced professional level. We work with – mothers who want to save money by braiding your children’s hair. Unemployed person who want to earn money by gaining a skill that guarantees income in your hands, start your business and become your own boss? Employed and not sure about your job but wants to earn extra income. Salon owners who want to increase your profit and grow your business. Hairdressing students who wants to add more skill to what you have. A hair braider who wants to become professional to attract the right clients. etc etc. Why Professional Hair Braiding?Hair & Beauty industry is at its most lucrative right now. Market research confirms that consumption in this industry is expected to be as high as $4.2 trillion by 2013. www.marketresearch.com. This is why we at World of Braiding are happy to help you earn from this business and be part of an exciting industry. 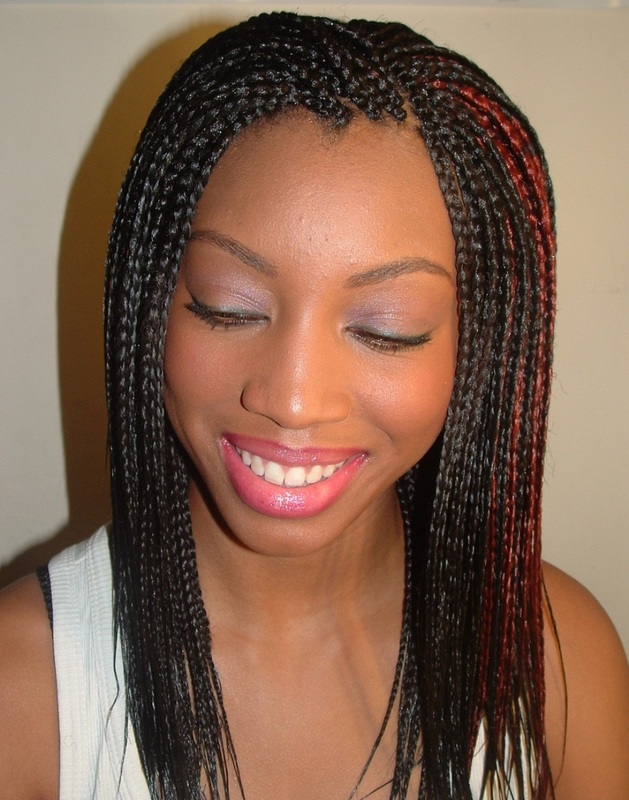 Our passion is our commitment to help you achieve your dream of gaining the skill of hair braiding. One thing we guarantee is that you will gain the skill of braiding. 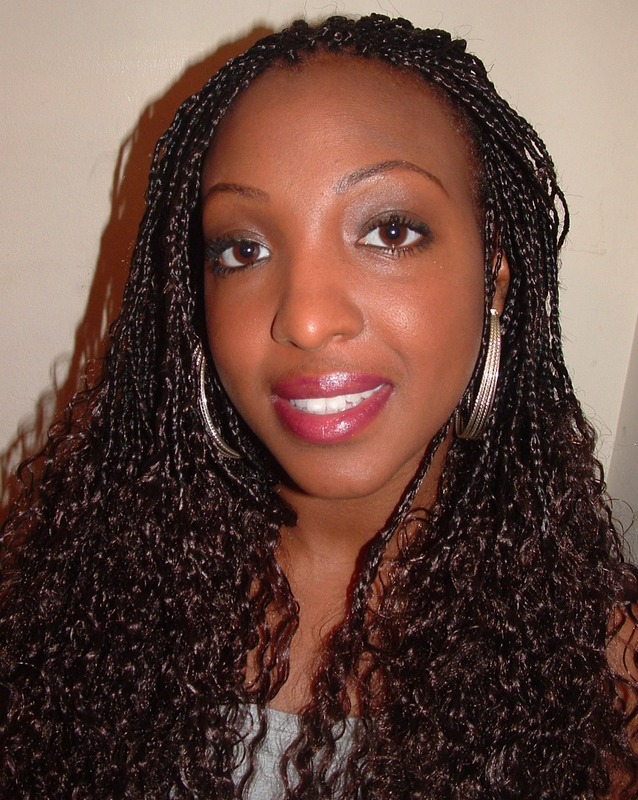 Our Chief Trainer Joy Phido is an experienced Master Braiding Stylist, a State Registered Hairdresser with the UK Hairdressing Council, a qualified teacher and is experienced in a variety of businesses. With the world’s awareness of healthy hair, the demand for glamorous hair extensions styles made popular by celebrities, this is your opportunity to take: HAIR BRAIDING & EXTENSIONS TO THE NEXT LEVEL. This course gives a general introduction to braiding. It involves the basic skill of braiding from the beginner level. Ideal for students who are new to braiding or are not sure of their braiding skill. Duration: 5 days (10am – 5pm) of intensive hands-on & theory training. Gain a full knowledge of all areas of braiding – singles, cornrows, twisting, weaving, locking and extensions in a full course that contains a combination of all you need to get into the business. Suitable to students who already own salons or intend to start a salon but need the know-how to move their business forward and avoid turning away clients. Also suitable to international students who do not want to keep travelling to improve on skills or take different classes. Note: Students do not need any prior experience or knowledge of braiding as this course also deals with all levels that students may require. Duration: 12 days (10am – 5pm) Flexible (£2500). Training Dates: Recommended 1 day a week & flexible as required by student. 3. AFRO /EUROPEAN WEAVING/EXTENSIONS COURSE: This course is aimed at offering the skill of weaving to add extensions to client’s hair. It includes stitching with needles & thread and other current weave techniques. The skill you gain can be applied on women of all races who have different natural hair types (Afro, European or Asian). With four weave techniques, you will gain so much to add to your salon service – full cornrow weave, European track weave & Micro bead strand-by-strand extensions (the most healthy & natural extensions used by celebrities). In addition to the techniques, you will learn how to cut & style your weave, flat iron, curl etc. You will get to know about health & safety in hair weaving, weave maintenance, products, quality weave extensions to give the most glamorous natural looking weaves, take out weaves/ extensions etc. Duration: 10 days (10am – 5pm) of intensive hands-on training. Pick your techniques on a pay as you go plan. This plan helps you to organize your budget to suit your training. For example, you can braid but you need the latest braiding technique to add more to your existing line of service or to braid a particular technique on your family and friends. Duration: 1 day (10am – 5pm) of intensive hands-on training. Training Dates: Evening or Day classes available. **OR GET A BRAIDING STARTER KIT FROM US AT A FEE TO BE CONFIRMED**. 3 By Credit or Debit cards. All major credit cards accepted. Call with your details. TERMS & CONDITIONS: TO SECURE & CONFIRM YOUR TRAINING· COMPLETE PAYMENT HAS TO BE MADE AT LEAST ONE WEEK BEFORE TRAINING DATE AS IT ALLOWS FOR SMOOTH ADMINISTRATION.· TO AVOID COMPLICATED ADMINISTRATION, PAYMENT WILL NOT BE ACCEPTED ON DAY OF TRAINING. ARE YOU CREATIVE AND ARTISTIC ENOUGH TO OFFER YOUR CLIENTS THE LATEST IN HAIR STYLE FASHION TRENDS? If any of these questions meet your needs then why not attend this bootcamp where we l teach, provide and equip you with valuable information & tips on how to grow, promote and market your salon on a low budget marketing plan – using internet technology, creating your database, using the Press etc etc. You will also get to know how to include multiple streams of hair style to your salon to increase your profit and ACCELERATE your growth. Hairdressers did not consider my feelings when they started slapping chemical relaxers into my hair. For these reasons and more, we have structured our training to address all these issues and many more. We aim to train you to be ahead of your clients. We want you to be contemporary and fashionable so we do not lose out on our precious clients who have options and will take their business elsewhere if we do not meet their demands. We want to make our industry respectable to all, glamorous and appreciated by our clients as well as profitable to all of us. LOW BUDGET ADVERTISING AND MANY MORE Price: £299.00 . 5. SET SPECIALIST COURSESThese courses are specialized in different areas of braiding and is useful to students who are interested in becoming SPECIALIST OR EXPERTS in their chosen areas of braiding. e EXTENSIONS – 3 techniques of strand-by-strand extensions including full information /theory on extensions (worn by celebrities). £1,000 – 2 days (glue gun extn, micro bead extns, pre-bonded extns)Duration: see individual courses. Note: Some specialist course may require prior knowledge of braiding skill e.g weaving skill. Content of course will be negotiated between student and trainer.Training days – Discuss with Trainer. 6. 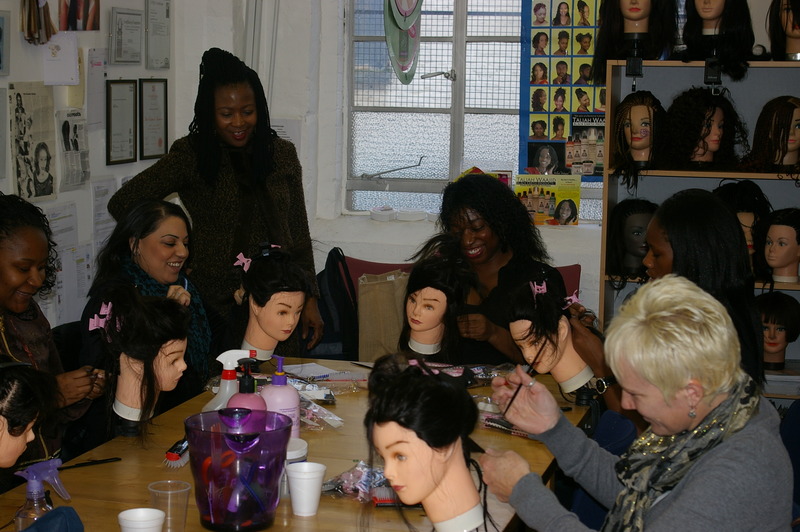 LACE WIG INSTALLATION COURSES Why not train to be a qualified lace wig technician with our intensive HANDS-ON-TRAINING WORKSHOP. With lace wigs made popular by celebrities like Tyra Banks, Beyonce’, Jada Pinket-Smith, Oprah Winfrey etc, this is the time to join others who are creating beauty on their clients and making money from it. Duration: 3 dayS (10am – 5pm) of intensive hands-on training. 7 INTERNATIONAL HAIRBRAIDING ©This is top of the range full packaged training to get students into every aspect of the braiding business. This course is for anyone who wants to be fully involved with Hair Braiding on an international basis and level. This student not only gets well informed in knowledge but gets all the practical work they desire to be up and running in the business. The content includes modern braids on all hair types such as European (Caucasian hair), Afro hair types of all textures – natural or chemically relaxed hair, Asian hair types etc. This course releases the creativity of students to explore and try new ideas. Skills to be gained range from modern cornrows; modern twists, modern weaves, to extensions (strand-by-strand used by celebrities). This full course combines all the specialist courses and is aimed at students who are ready to move their braiding business to the next level on the international arena. On the other hand – Have no time to attend our workshop? Too busy with the family or at work?Not able to finance your course but still keen on learning your skill? Want to learn at your own pace?If your answer is yes to any of the questions, then why not buy the DVD which teaches you the 4 techniques in our introduction course.By popular demand, we have put together this practical DVD that will give you the skill you need in the comfort of your home.In this DVD, let Joy show you how to create clean and precise sections to start your braids, show you the correct finger placement to start braiding hair and complete a full head of braids and cornrows on all hair types. Call for details. Avoid the pitfalls of starting a business. Buy into our knowledge, experiences and wealth of information when you directly work with us to gain hands-on knowledge, skill and everything that will get you into the business of hair braiding. We will guide you by the hand so you do not deal with the teething problems of starting a business. Become a Master Braider as you simply become us in your chosen location. You are now a part of our growing business and we will bring everything we know to you.Suitable to anyone who knows they are ready for the business of braiding as we are ready to work with you. Note: Students do not need any prior experience or knowledge of braiding business as we will offer every skill there is to know. The only requirement is that you are ready to start and grow. Training dates – Contact us for details. Do you like the idea of becoming a trainer. If yes, why not become part of our training team. You will not only become a Master Braider but you will also know how to start training students in your neighborhood with our full backing and support. We will guide you through the whole process. Buy into our knowledge, experiences and wealth of information when you directly work with us to gain hands-on knowledge, skill and everything that will get you into the business of hair braiding and training. You will not deal with the teething problems of starting your business. Become a Braid Consultant Affiliate as you simply become us in your chosen location. You are now a part of our growing business and we will bring everything we know to you – braiding skill & training.Suitable to anyone who knows they are ready for the business of braiding and training as we are ready to work with you. Note: Students do not need any prior experience or knowledge of braiding business as we will offer every skill there is to know. The only requirement is that you are ready to start and grow. Price: £30,000 Training dates – Contact us for details. Calling in particular on our graduates/ past students and everyone in general to make extra money.Become our Marketing Affiliate in your local area by hosting our training. Introduce us to your local area when you advise us with local information /knowledge on how to advertise in the local papers, the best training location, accommodation etc and get paid for your trouble. Get paid 10% for every student we train in your location. Suitable to anyone who knows about hair braiding or is interested in the business of braiding. We also give you free training if you want to be part of the workshop. We exhibited at the Salon International 2009 and worked tirelessly at the show. Students watching a demo and getting on with the hands-on practice. Getting information is part of our training.A Hair Beauty Boot camp in progress. Graduating students with their certificates.You could be the next person.Trained students getting their hands into action at the American School in London Alumni day where the demand for our service was enormous – long queues.- Interest in our stand at Salon International London 2009 was overwhelming. AND MANY MORE FROM VARIOUS WORKS OF LIFE & COUNTRIESGIVE US A CALL TODAY TO BOOK YOUR TRAINING FROM ONLY THE BEST AND MOST DETAILED HAIR BRAIDING PROVIDER. EXTENSIONS & BRAIDING SALON – glam your look always…. 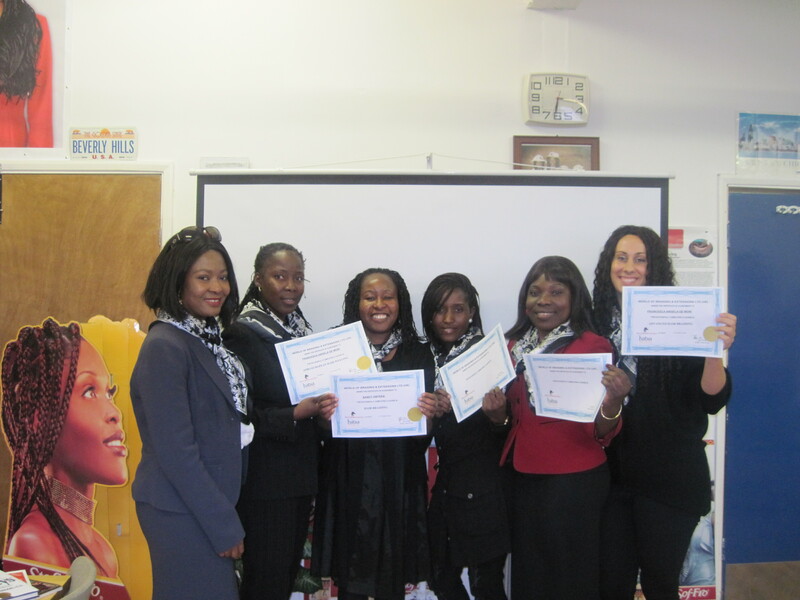 WORLD OF BRAIDING & EXTENSIONS IS UK’S FIRST HAIR BRAIDING ACADEMY. WITH HABIA CPD CERTIFICATION, A PROFESSIONAL CLASSROOM ATTACHED TO A BRAIDING SALON, WORLD OF BRAIDING IS THE INDUSTRY’S LEADER IN HAIR BRAIDING TRAINING. 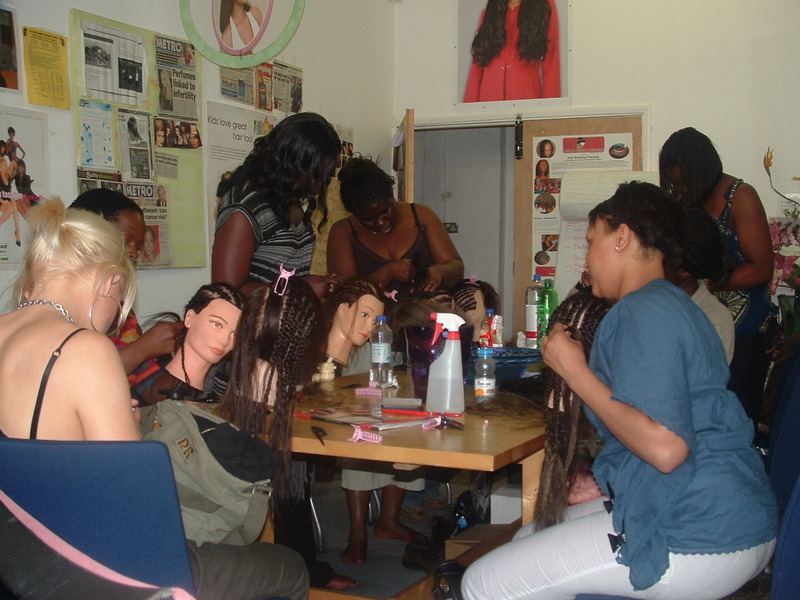 NOW WITH OVER 7 YEARS EXPERIENCE OF TEACHING HAIR BRAIDING & EXTENSIONS IN VARIOUS LONDON COUNCILS, WE HAVE TRAINED STUDENTS FROM A VARIETY OF BACKGROUNDS IN UK CITIES AND THE WORLD OVER – USA, POLAND, NORWAY, SLOVAKIA, SWITZERLAND, NETHERLAND, SOUTH AFRICA, BARBADOS TO NAME A FEW WHO HAVE QUALIFIED TO RUN SUCCESSFUL SALONS. THE CHIEF TRAINER JOY PHIDO IS AN EXPERIENCED MASTER BRAIDER, A STATE REGISTERED HAIRDRESSER WITH THE UK HAIRDRESSING COUNCIL & A QUALIFIED TEACHER. WE EXHIBIT AT VARIOUS NATIONAL & INTERNATIONAL HAIR SHOWS INCLUDING THE INDUSTRY’S MOST PRESTIGIOUS SALON INTERNATIONAL SHOW IN LONDON.